You always try to have your customers leave the store with the perfect product - but sometimes that doesn't happen. Maybe it's a size too big or the color isn't exactly right. For whatever reason, you can often fix the issue by exchanging the product for something else. If the customer is simply returning the item, and not getting a new product, follow the instructions for a Return in Ascend. 1. Select the Sale icon or Create > Sale from the Ascend desktop. 2. Attach a customer to the sale. 3. 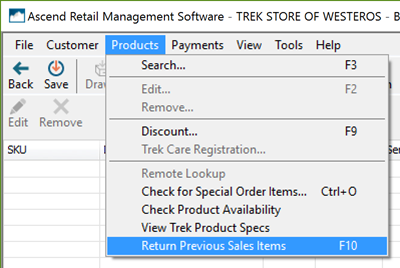 If the customer has their receipt select Products > Return Previous Sales Items (or press F10 on the keyboard to open this window). b. Check the item(s) being returned. 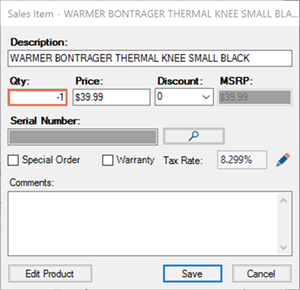 c. Select Add to add the product(s) to the sales screen with a negative quantity. 4. If the customer does not have their receipt, add the product manually. a. Scan the item barcode or search for it in the product search bar. 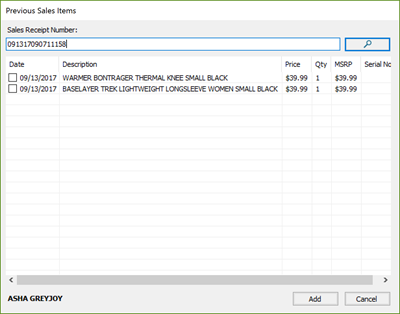 b. Double-click the sales item to edit it. c. change the quantity to a negative value (such as -1 if the customer is returning 1 of the item). 5. The Total shows the price in parentheses, indicating a negative value. 6. Now add the product the customer is taking home to the sale by either scanning the barcode or searching for the product. A positive quantity is added by default. Finish the transaction like a normal sale. Add any additional items and take payment, if needed. If the returned item was worth more than the new item, you may still have a negative balance on the sale. If the customer isn't buying anything else today, simply choose the payment method you'll be using to refund that amount (we recommend Instore Credit so the customer can spend that balance on their next visit to your shop! ).